Rachel Corrie was a 23-year-old American peace activist who was crushed to death by an Israeli bulldozer on 16 March 2003. At the time she was killed she was trying to peacefully block the Israeli authorities from illegally demolishing a Palestinian home in the Occupied Palestinian Territories. Since her brutal killing, the Corrie family, as well as Rachel’s friends and supporters, have devoted their time, energy and efforts to keep Rachel’s legacy of fighting for justice alive. More than 15 years after the death of American hero Rachel Corrie, still no justice for Corrie. “The Palestinian struggle is a struggle for human rights and justice that appeals to all supporters of human rights around the world,” said Imad Hamad, AHRC Executive Director. “We are all indebted to the heroes who risk their lives and limbs to stand up for the human rights of others,” added Hamad. “We can all honor the memory of Rachel by supporting Palestinian rights and by donating to her Foundation,” concluded Hamad. 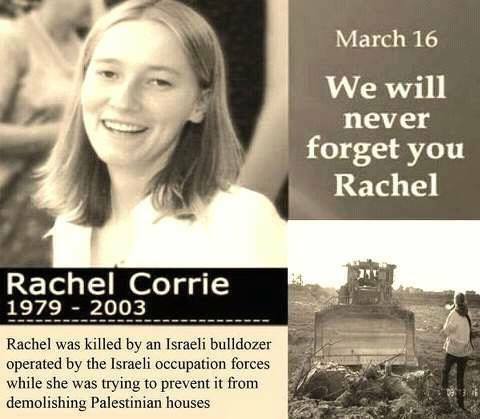 The Palestinian Orthodox Church of America joins the Corrie family today to remember Rachel Corrie, a Hero and a martyr for the Human Rights Race. Today we join with The American Human Rights Council (AHRC-USA) to tell you she will never be forgotten in Palestine and in our Palestinian Churches in America. On behalf of our Archbishop Metropolitan Melchisdeck of the Palestinian Orthodox Church of America and members we wish you God’s blessings and Grace to be always comforted for strengthed to continue protecting the Humanitarian Rights of Palestine and the human race.